Weather is of course, unpredictable. Battling the weather during half marathon training can be an exercise in itself. Being prepared for the cold, the rain, or the heat can really impact a training run or a race for that matter. Your body is pretty incredible and can handle running through some pretty terrible running conditions. However, the right timing and the right gear can make a big difference on how comfortable the run will be. You will want to take precautions in extreme conditions, but it is still possible to run outside most days of the year. As for the rain, it is like nature’s air-conditioning! Unless it is near freezing and windy, it can actually be quite refreshing. However, if you are faced with unsafe conditions, remember that no run is worth your life. The right timing and flexibility is important if you are trying to stay comfortable. 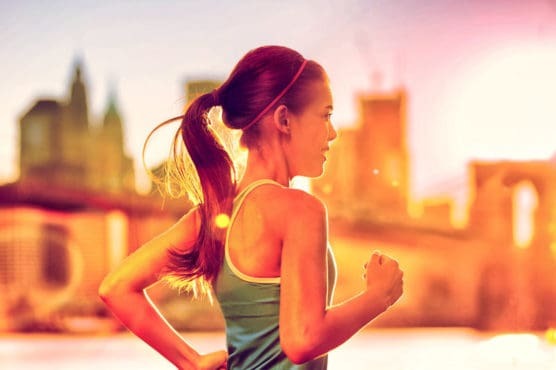 Runners faced with extreme heat should avoid the midday hours. Temperatures are generally coolest in the mornings and those training during the summer should get used to setting their alarm clocks early. Run Wednesday morning’s run on Tuesday night. Swap your longer run for a different day in the week. Three miles in the rain might not be too bad, but 10 miles could potentially be miserable. Try to ensure that you do at least all of your long runs outside so you have the confidence come race day. Hats and visors are super versatile for many weather conditions. Brims keep the rain and sun away from your face and a thick hat can provide a tremendous amount of warmth in cold weather. A rain jacket is especially useful in cooler rainy conditions. John, a half-marathoner from New York loves his REI event jacket to keep dry. For the budget-conscious cool-weather runner, arm warmers make great layering pieces as they are easy to remove and often much less than expensive than long-sleeved tech t-shirts. Extreme weather conditions require more planning than a sunny 60° day. In cold weather, make sure to wear gloves and a hat to keep your extremities well-protected. A face mask may be necessary in extreme cold. Also, dress in multiple thin layers so you have the opportunity to cool off as your body temperature warms. Hot weather requires a lot of hydration planning. Ensure you are properly hydrated before attempting a run. Additionally, use a fuel belt, handheld, or plant bottle along the route to ensure you stay hydrated. It is far better to be over prepared with water than run the risk of heat exhaustion or heat stroke. Wear light colored moisture-wicking material and take walk breaks if necessary. Most runners will be checking the weather forecourt regularly as race day approaches. Races are rarely cancelled due to weather conditions so be prepared for whatever Mother Nature throws your way. If your first race happens to be on a really hot, really cold, or really rainy day, just remember that you will have an easier opportunity to PR if you decide to race again. Commiserate with the other runners and enjoy earning a great first half marathon story.